Gulliver's sailing ship Adventure is steered off course by storms and forced to go in to land for want of fresh water, Gulliver is abandoned by his companions are set upon by "a huge creature" that chases them into the ocean and back to their ship. Gulliver is found by the Brobdingnagians who are humans but around 72 feet tall. They are curious and interested in him. 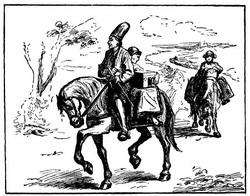 The farmer on whose land Gulliver was found brings him home. The farmers daughter is fascinated by Gulliver takes care of him. Gulliver refers to her as Glumdalclitch (nurse). The farmer treats him as a curiosity and exhibits him for money throughout the kingdom. The word gets out and the Queen of Brobdingnag wants to see the show. She loves Gulliver and he is then bought by her and kept as a favourite at court. The farmer's daughter, Glumdalclitch, becomes a member of the Queen's court as Gulliver's nurse. The King and Queen of Brobdingnag love Gulliver, but the Queen's dwarf is very jealous because the queen is now more fond of Gulliver. Since Gulliver is too small to use their huge chairs, beds, knives and forks, the queen commissions a small house to be built for Gulliver so that he can be carried around in it. This box is referred to as his travelling box. Gulliver has many accidents during his stay there. The Queen's dwarf drops barrel-sized apples on him, hailstones as big as tennis balls batter and bruise him, a dog picks him up in his mouth and carries him to the royal gardener and a bird of prey nearly grabs him. The queen has a toy boat made for him that Gulliver uses. One day a frog jumps on his boat and Gulliver has to deal with it. The greatest danger comes from a monkey that snatches Gulliver and carries him to the roof of the Palace where he is rescued. 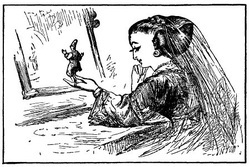 Gulliver amuses himself by using the Brobdingnagian King's stubble to create a comb and chairs from the Queens hair. He also plays the Piano for them by running up and down the keys. Gulliver discusses the state of Europe with the King. The King is not impressed with Gulliver's accounts of Europe, especially upon learning of the usage of guns and cannons. After spending over two years in Brobdingnag, on a trip to the seaside, his "travelling box" is seized by a giant eagle. The eagle then drops Gulliver and his box right into the sea where he is picked up by some sailors, who return him to England. 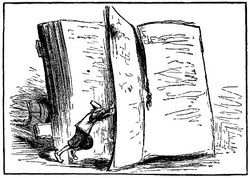 Scroll down to browse through these beautiful illustrations of Gulliver's travels in Brobdingnag. If you are interested in the history of Brobdingna go to Brobdingnagian History, Politics & Culture . Click on the pictures below to watch videos & read more about Gulliver's adventures. Watch the video of beautiful Illustrations of Gulliver's Travels in Brobdingnag set to music. A great storm described; the long-boat sent to fetch water, Gulliver goes with it to discover the country. He is left on shore, is seized by one of the natives, and carried to a farmer's house. His reception there, with several accidents that happened there. A description of the Brobdingnagians. A description of the farmer's daughter. Gulliver carried to a market-town, and then to the metropolis. The particulars of his journey. Gulliver sent for to court. The Brobdingnagian queen buys him of his master the farmer, and presents him to the king. He disputes with his majesty's great scholars. An apartment at Brobdingnagian court provided for Gulliver . He is in high favor with the queen. He stands up for the honor of his own country. He quarrels with the queen's dwarf. The country of Brobdingnag described. A proposal for correcting modern maps. The king's palace, and some account of the metropolis. Gulliver's way of travelling. The chief temple described. Several adventures that happened to Gulliver . The execution of a criminal. 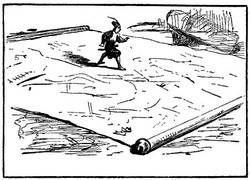 Gulliver shows his skill in navigation. Several contrivances of Gulliver to please the king and queen. He shows his skill in music. The king inquires into the state of Europe, which Gulliver relates to him. The king's observations thereon. Gulliver 's love of his country. He makes a proposal of much advantage to the king, which is rejected. The Brobdingnagian king's great ignorance in politics. The learning of Brobdingnag very imperfect and confined. Their laws, and military affairs, and parties in the state of Brobdingnag. The king and queen make a progress to the frontiers. Gulliver attends them. The manner in which he leaves Brobdingnag very particularly related. He returns to England. You can now get more details on Brobdingnag's history, politics, culture & satire . Click on the pictures below to watch videos & read more about Gulliver's adventures.